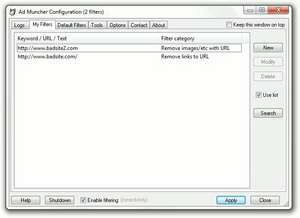 Ad Muncher is a software download for Windows systems which removes adverts, popups and other annoying things from all popular browsers, as well as most banner displaying and popup generating programs like ICQ, Morpheus, Kazaa, Grokster, Opera, PalTalk, iMesh, Bearshare, LimeWire, etc. Ad Muncher 4.94 is a shareware program and can be used as a demo to try the software until the free trial period has ended. A full version of the program is available after the trial period ends. For security reasons, you should also check out the Ad Muncher download at LO4D.com which includes virus and malware tests. Additional screenshots of this application download may be available, too. Ad Muncher has a presence on social networks. Ad Muncher download been highly rated by our users.